Venus as evening star in Scorpio conjunct Saturn and the North Node of the Moon at the time of the Full Moon on September 19, 2013. Mars in Leo square Venus, Saturn, and North Node of Moon in Scorpio. Mercury in Libra square Jupiter in Cancer at the exact same time as the Full Moon. The Pisces full moon to the sun being in Virgo is one of the most magical full moons to me, in part because it can occur around the time of the Equinox. Yet there is more to it than that- the Moon in its most magnetic splendor connects well with the passionate and devotional nature of the sign of Pisces, a sign that always calls on us to follow our dreams into the distant beyond, full moon or not. And this visionary Pisces Moon is a perfect balance point to the more focused nature of the sun being in Virgo, a sign that can be incredibly productive in a detail-oriented manner, but can stand to benefit from the larger emotional view received from a lunar Pisces. In his book on Sabian Symbols, Dane Rudhyar describes the 27th degree of Pisces where this full lunation is occurring as being “The Harvest Moon illumines a clear Autumnal sky,” a perfect symbol for the fact that in the Northern Hemisphere of planet Earth, we actually are experiencing the Harvest Moon of the Autumn Equinox at this time. However, no matter what hemisphere we are living in, we are experiencing a full moon a few days before an equinox that is brightly illuminating a significant archetypal scene. and from chaos She has led us by the hand. Ishtar is the Queen of Heaven who calls us forth on our path through the way of Love, a deity who connects with other prominent Goddesses of myth such as Inanna, Isis, Aphrodite, and Venus. With the planet Venus in Scorpio conjunct both Saturn and the North Node of the Moon at the time of today’s Pisces Harvest Full Moon, a Venus that is also in her most radiant glory as a bright evening star one can watch set every night, the Queen of Heaven is calling for us to follow the love of our hearts forward at this time through whatever difficulties or cacophonous fury we may have had to recently navigate. If we have been damaged by life, we have the advantage of knowing we can survive no matter what, and this is a time to take steps forward courageously on the path we can feel our hearts guiding us toward. The association between Venus and Ishtar is illuminating to consider at this time, as the various aspects Venus in Scorpio is experiencing in transit at the moment seems fitting for the mythic story of Ishtar’s descent to the underworld to face the wrath of Ereshkigal, the queen of the underworld. The planet modern astrologers identify with Venus was originally linked to the Goddesses Inanna and Ishtar by the Mesopotamian people who were one of the original inventors of astrology, with the civilization of Uruk being especially vital to the worship of Ishtar. 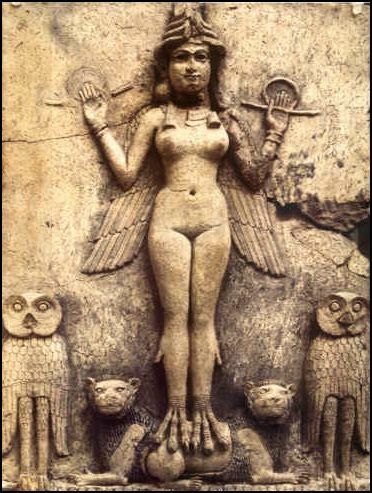 Michael Baigent, in his amazing book From the Omens of Babylon: Astrology and Ancient Mesopotamia, researched that it is hard to find a consistent portrayal of Ishtar because of how over time she seemed to integrate the meanings of different Goddess figures. The planet Venus was originally connected to Inanna by the Sumerian people, and with contact from Semitic and other people, eventually the figure of Ishtar emerged “to be the daughter (and first born) of Sin, the Moon, twin sister to Shamash, the Sun, and sister too of both Erishkigal, the much feared queen of the underworld, and Tammuz, the dying and resurrecting god…” with Ishtar assuming the role of “the queen of heaven, the beautiful goddess of love, sexuality, and childbirth” (Baigent, p. 118). Baigent also found that tablets dating from the reign of Ashurbanipal, who lived from 668-627 BC, reveal that Ishtar as the planet Venus embodied both male and female characteristics at least at one point in time, with the Ishtar of the morning star being a male, and the Ishtar of the evening star being a female. Baigent also has found evidence in his research that Venus as the evening star was associated with having a “good harvest” (p. 122), which is a good thing because Venus in Scorpio was also associated with a harvest being destroyed! Venus being an evening star at this time, and so beautiful to behold in the night sky, to me opens her archetype to embodying more of the harmonizing energy of Ishtar at this time. Indeed, even in ancient Assyria the planet Venus was seen as being capable of harmonizing difficult energies, as many of the dangers associated with eclipses were seen as being averted with Venus occupying a significant aspect, such as a conjunction with Jupiter or Saturn. In addition, the interpretation of Venus as an evening star being more of a harmonizing influence continues today in the modern astrological perspective. Ishtar was also connected to the harvest in addition to the fertility of sexuality, and the planet Venus in various aspects at various times could indicate a bountiful harvest. However, in addition to her association with abundant fertility and the harvest, Ishtar also had ancient connections with war, although Baigent in his book is careful to note that the planet Venus was only one of many omens taken into consideration surrounding military actions. This “warring” side of Ishtar, however, is also important to take into consideration at this time, as there are versions of myth that indicate the reason she descended to the underworld and was met by furious hostility by the queen of the underworld, Ereshkigal, was because of manipulative and warring action taken by Ishtar that caused the death of Ereshkigal’s husband, the Bull of Heaven. Thus, from this interpretation’s perspective, when Ishtar descends to the underworld, having to remove an important garment at each of the seven gates to the underworld, only in the end to be hung on a meat hook by the queen of the underworld, there is more of vengeful anger to Ereshkigal’s actions meant to punish Ishtar than just irrational madness meant to humiliate her (Mark, 2011). Events in which the more warring side of the Venus and Ishtar archetype is appearing at this time, could in part be corresponding with the current square from Mars in Leo to Venus, Saturn, and the North Node in Scorpio. There is also the popular Jungian interpretation of Ishtar’s descent, that her becoming stripped down to her barest essentials is a metaphor for becoming more whole, more fully one’s individuated Self. To me, the important lesson to take from Ishtar’s descent to the underworld is that she experiences the humiliation of losing her most prized possessions, aspects of herself she had become attached to and had begun to derive great vanity from. She is then practically put to death by the queen of the underworld, with her corpse hung on a meat hook. So what is the lesson? The lesson is that Ishtar returns from the underworld. She is a survivor, she does not die, and she returns to the upperworld a stronger person more in touch with her essential nature. In our psychological management of creating a sense of stability from what otherwise could appear to be a chaotic life, many of us find our security and sense of self from our jobs, our family, our relationships, or our community. Ishtar now asks each one of us: what is inside you? What do you possess without a home, job, family, partner, or possessions? If we have been undergoing difficult losses of an external nature, or been experiencing deep changes within our internal landscape, with the current conjunction between Venus, Saturn, and the North Node of the Moon in Scorpio, in sextile to Pluto in Capricorn, no matter what is happening if we courageously face the present moment, we will get a step closer to the future of our full potential. When considering the conjunction between Venus and Saturn in Scorpio through the mythology of Ishtar, it is also helpful to consider her Assyrian counterpart of Ninurta, who was the God connected to the planet Saturn in ancient Mesopotamia. Michael Baigent found in his research of Babylonian myths translated from tablets that the ancient Assyrians did not view Saturn as “a stern and cold patriarch but as a conquering hero” (p. 127-128). In modern astrology many authors tend to describe Saturn as a limiting or restricting influence, but it is important to remember in the end that necessity is the mother of invention, and so in a similar way can the difficulties of Saturn help father our heroic qualities to emerge in radiant brilliance at the most opportune times in our lives. Baigent found that Ninurta was a hero in myth because he was able to retrieve the “tablets of fate” containing eternal laws that gave the possessor of the tablets the power over fate (p. 128). These tablets of fate were stolen by Zu, a winged dragon of chaos who was in league with the great sea serpent of chaos, Tiamat (Baigent, p. 128). Everyone was too afraid of the dragon to do anything, except for Ninurta, the brother of Nergal (Mars), who not only volunteered to fight the dragon, but also became victorious, was given custody of the tablets in gratitude by the other Gods, and ultimately took on the role of being the “overseer of destiny and fate” in Assyrian culture (p. 128-129). Ninurta gaining a role in overseeing fate by defeating a dragon of chaos is interesting to me on a personal level, as I recently listened to a lecture given by astrologer Bernadette Brady linking chaos theory with astrology while integrating the Mesopotamian myth of the hero Marduk (Jupiter) defeating Tiamat, the great sea serpent of chaos. 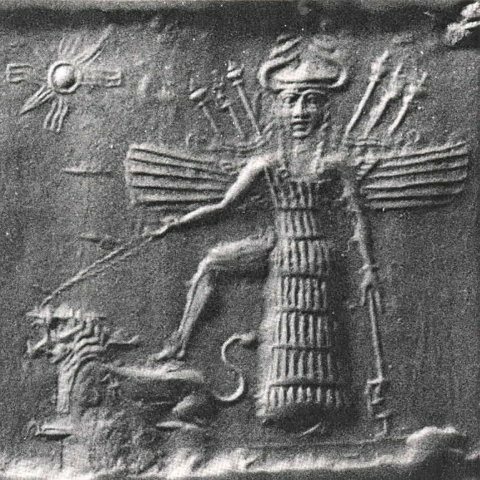 In her lecture Brady described how astrology was created in Mesopotamia as a tool for navigating chaos, but that over time the chaos paradigm was defeated by reason and the mechanical/causal paradigm currently dominating modern worldviews in a manner similar to how Marduk defeated Tiamat. Brady explained that astrology aligns with chaos theory because it posits that while one cannot predict with certainty what will exactly happen, one can get a sense of the timing of events as well as the level of quality of these events. As chaos theory also integrates fractals which have re-occurring patterns around “strange attractors,” in a similar manner our astrological birth charts can indicate re-occurring patterns from our family as well as the collective unconscious contained in myths that we are experiencing and re-experiencing. Using astrology as a tool, one can get a better grasp on these patterns as well as discern a more productive and fruitful path one can follow in greater alignment with the full potential of the birth chart. Thus we can use astrology to help us predict upcoming time periods that may be especially intense, as well as to figure out what patterns we have been playing out and how to most effectively respond to move forward in a productive manner that will lead to us actualizing more of our full potential. This idea of astrology being used to gain a greater ability to navigate our “fate,” has an interesting link back to the Ninurta of myth, because Baigent also found that the human representation of Ninurta often portrayed was as a man holding a “seven-headed weapon” which could possibly have been a symbol of the seven planets used in ancient astrology (p.129). By mentioning this, however, I don’t mean to suggest here that the study of astrology is of particular importance at this time of the Full Moon with Venus and Saturn conjunct in Scorpio. What I do mean to suggest is the importance of each one of us stepping bravely forward on our own unique heroic journey, with the courage to face whatever dragons or demons arise before us, utilizing the resources around us or that we carry inside us. Saturn in astrology occurring in an intense aspect, such as currently being conjunct Venus and in square to Mars, does not need to pre-determine you to experiencing great loss, restriction, or sadness. It very well may correlate, however, with some intense experiences that will require all of your being invested in moving you forward on the most productive path for your unique self, no matter what obstacles may be appearing before you. The other image often associated with Ninurta is the eagle, which also happens to be one of the symbols of Scorpio, the sign presently holding the conjunction of Saturn and Venus, Ninurta and Ishtar. The eagle is the higher evolved Scorpio, the Scorpio who has no need to manipulate or unload emotional diatribes on others in response to being overly sensitive to negative emotional environments. Instead, Scorpio as the eagle is able to utilize its authenticity in order to inspire instead of manipulate others. Scorpio is a sign that is capable of great loyalty and commitment, as well as an enhanced ability to get down to living the essential nature of one’s Self. When we connect this Eagle/Ninurta aspect of Saturn into its conjunction with Venus, we find ourselves again with Ishtar, turning to look upward with resolution from the underworld. Ishtar will survive, and she will continue to walk through the terrible chaos and create new life through the way of love. Once we connect with the essential Self within each of us, come to more fully realize the full potential of our unique being, we become even more powerful and effective in collaboration and community with others on a similar journey of the soul as our own (Venus and Saturn conjunct the North Node of the Moon in Scorpio). I would like to emphasize here that is not necessary to believe in God, or even Gods, for this symbol to be meaningful, and in case the mentioning of the “Will of God” is a trigger for you, I hope you do not neglect to listen to the actual wisdom of the above symbol. The point, “to surrender our separative ego-consciousness,” is pretty much exactly what happened to Ishtar during her descent to the underworld, in her experience of her various trials and tribulations. Similarly, whatever we have been experiencing recently, we must remember that life will be going on and that there is a part that each one of us is uniquely designed to play in the unfolding of future events. The more we can get into the flow, the more easy this experience could be for us. However, with many intense aspects going on in the moment, such as Mars in Leo in square to all the Scorpio (Venus, Saturn, North Node), and Mercury in Libra in square to Jupiter in Cancer (following a few days after Mercury in Libra was in direct opposition to Uranus in Aries), it may not exactly feel like we are entering a “flow.” However, if it has been feeling like we have been in the flow of things, keep at it, because most likely you are then on track. If in contrast events have felt destructive and depressive, hopefully through a process of deep reflection we can notice signs of what aspects of our loss may have been getting in the way of our full potential, no matter what sense of comfort our attachment to it may have brought us. If we are in a dark place, it is absolutely necessary at this time to courageously step forward on our path with all of our resources ready at our disposal. This is not a time to be sitting passively on the sidelines. This is a time to step forward brilliantly, or at least as brilliantly as we can manage it, on our unique path and calling. Full Moon at 27 degrees of Pisces, the third decan of Pisces. 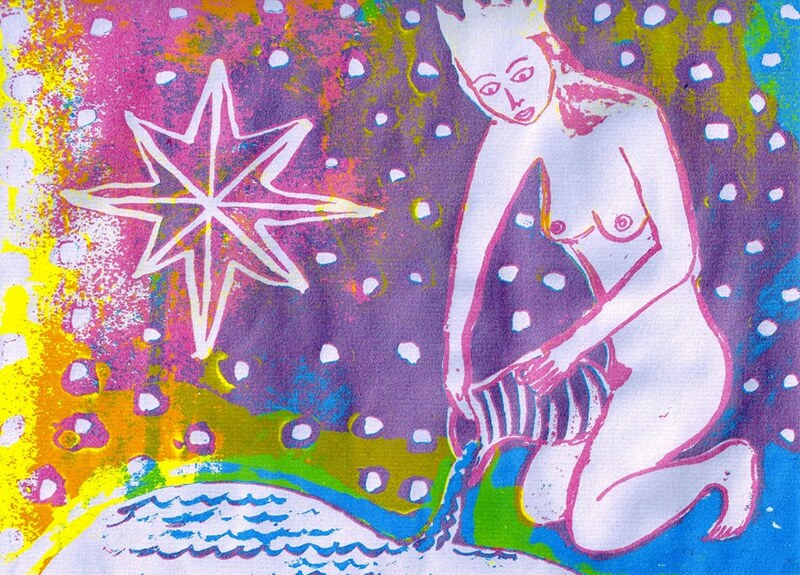 The third decan of Pisces (20-30 degrees) is part of the rulership of the Queen of Wands in tarot. Elements and astrology: The water aspect of fire. Sagitarius. Rules the last decan of Pisces and the first two of Aries. Personality traits: Master of self-knowledge, change and transformation. The mother of mature love and sexuality. As a person, she is an older fire sign person who mirrors who you are and who you are not. She is open minded, strong willed and enterprising, dignified and compassionate, confident, energetic, and charismatic. She may be intolerant and jealous, temperamental and inconsiderate. The cautionary note at the end of the above quote, about the potential to be “intolerant” or “temperamental,” is important in consideration of the many intense aspects occurring, such as Mars square Venus/Saturn, and Mercury square Jupiter. However, if we are doing our hard work on a personal level, we will hopefully be able to rise above such negativity. 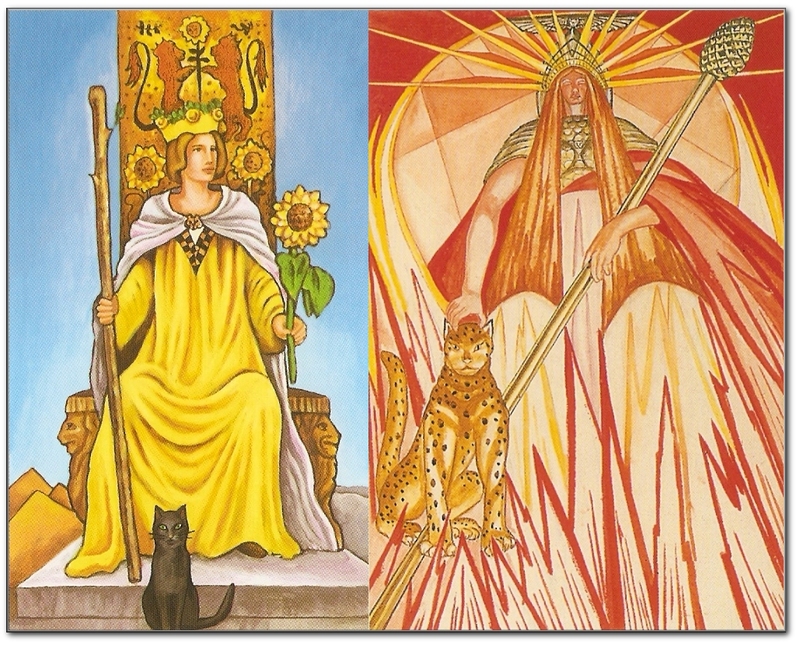 I love the image above of the Queen by Pamela Colman Smith from the Ride Waite Tarot deck (on the left) since the Queen of Wands is holding a sunflower, and in the northern hemisphere where I live there are currently sun flowers in full bloom. The awe inspiring sacred geometry of sun flowers, their immanent power captured in art by the likes of Vincent Van Gogh, is tantamount to the full potential that can bloom from our inner being. If you are currently experiencing a bountiful harvest of your own being in this way, celebrate! If you are not experiencing this harvest at the moment, remember that whatever you are experiencing is part of your process of self-discovery. This concept connects with the image of the Queen above on the right, from the Thoth deck, in which she is wearing the glyph for Pisces on her chest. This is a Queen who has been in touch with the dark places of her psyche that some of you may have been currently experiencing, and it is because of her contact and awareness of these dark places that she ultimately is able to actualize her full potential and come into the full realization of her self and soul nature. At this Pisces Full Moon, this Harvest Moon of the Northern Hemisphere, fearlessly take stock of where you currently are on your life’s journey and courageously take action on the calling arising from your heart inside. Baigent, Michael. (1994). From the Omens of Babylon: Astrology and Ancient Mesopotamia. Rudhyar, Dane. (1973). An Astrological Mandala: the cycle of transformations and its 360 symbolic phases: a reinterpreation of the Sabian symbols, presenting them as a contemporary American I Ching. Vintage books. I just wanted to write something about the Venus/Saturn alignment with the NN around the full Moon and Gray did it. Since this is all happening around the degrees of my natal NN, I foud it particularly exciting to read his thoughts. Ishtar is an extremely mysterious deity, but you managed to unveil a lot of her secrets in your article. The etymology of her name comprises burning, fire and east. East was the cardinal axis about which world maps were constructed. “It marked where the sun rose on the equinoxes, the first days of autumn and spring.” (a quote from A. Aveni’s Conversations with the Planets). She stood for the power of fire, creation, fertility, the new dawn. You captured all that (her warmth, her radiance, her life-giving power) so beautifully in your writing, thank you. She has enormous depths and darkness as well, which you showed also. Thank you, Monika. I wish I had included your reference to Ishtar being associated with the East and therefore the equinox- I feel like I have heard of the association of her name with the East before, but I didn’t make the connection with the equinox. I appreciate your compliments as I know that Ishtar is one of your favorites. I have only begun to look into her more deeply, but she is of course an important figure to take into account as far as Venus goes. I actually found a book about Inanna containing a lot of her myths translated from tablets in a used bookstore today! I love these repetitions they used there. He met me- he met me! He put his hand into my hand . . . This is a wonderful translation. Will share the title of the used book on Inanna you found? Great post! thanks! Thank you! The book is called “Inanna: Queen of Heaven and Earth: Her stories and hymns from Sumer” by Diane Wolkstein and Samuel Noah Kramer. The Lady of the Evening appears in the heavens . . . Thank you sooo much for such depth to this interesting and uplifting time for me!